Royal Caribbean said it was arranging flights for all 2,200 guests and passengers will get a full refund of their fare and a certificate for a future cruise. LINTHICUM, Md. — Passengers whose cruise vacations were cut short by a fire onboard the Grandeur of the Seas arrived back home Tuesday on charter flights from the Bahamas, many praising the crew’s response and some already planning their next sailings. Rebecca Killinger of Carlisle, Pa., said she had no idea how extensive the fire was until the ship got into dock. 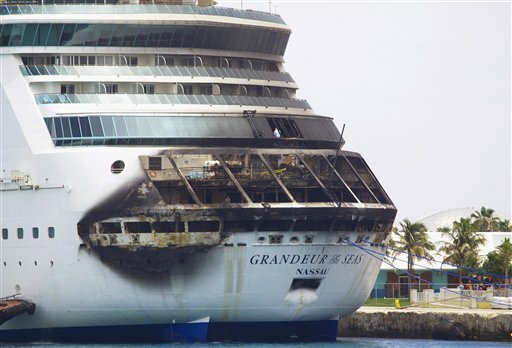 Photos of the Royal Caribbean ship show a large area of the stern charred on several decks, but Killinger said she was unaware of the damage until she debarked in Freeport, Bahamas. That’s in part because of the crew’s calm, orderly response, she said. “The crew was in total control, and there was no chaos,” she said, and some cracked jokes to lighten the mood. Passengers described being awoken in their cabins as crew members knocked on doors and sent them to evacuation stations with their life jackets shortly after the fire broke out at 2:50 a.m. Monday. Robert Alexander of Hamilton, N.J., said crew members from all parts of the Grandeur were involved. 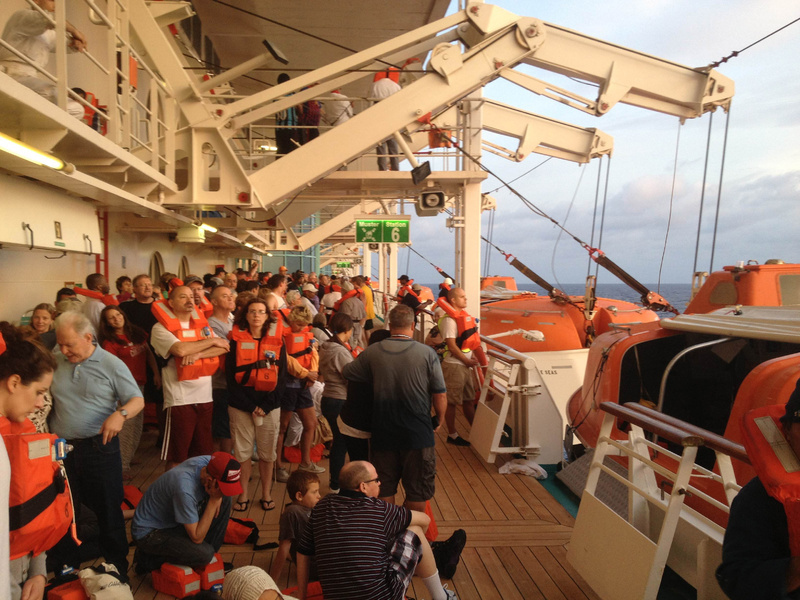 An actor from the ship’s theater made announcements as passengers left their rooms. Royal Caribbean says life boats were not boarded and power was never lost. The fire was extinguished in about two hours, with no injuries reported among the 2,200 passengers or the crew. The ship, which left Baltimore on Friday for a seven-night cruise, was headed originally to CocoCay, Bahamas, but instead sailed to Freeport on Monday afternoon. It remained there Tuesday. The vice president of the Grand Bahama Shipyard said the ship would be repaired at his facility, though a full assessment of damage hadn’t been done yet. “I’m assuming it will be a big job for us,” Reuben Byrd said. Royal Caribbean spokeswoman Cynthia Martinez did not immediately return phone calls or emails about the repairs. Earlier, she said she had no updates on the incident or cause. Byrd said the shipyard didn’t know about the cause, either. National Transportation Safety Board spokesman Eric Weiss said the agency has sent one senior investigator to the Bahamas. No other details about the investigation were available. Royal Caribbean said passengers would receive full fare refunds and certificates for a future cruise. The company chartered 11 flights for passengers to return to Baltimore-Washington International Airport. Craig Dzubak, 26, of Pittsburgh, was on the second. He said he and his wife were already planning their next sailing while traveling home. The fire aboard the Grandeur was the second to halt a cruise this year. The Carnival Triumph was disabled during a February cruise by an engine room fire in the Gulf of Mexico, leaving thousands of passengers to endure cold food, unsanitary conditions and power outages while the ship was towed to Mobile, Ala. It remained there for repairs until early May when it headed back to sea under its own power. Fran Golden, a blogger for the cruise magazine Porthole, said the two incidents were quite different. “I think it’s easier to make people happy when they’re not stuck on a ship for four days without toilets,” she said. Still, she applauded Royal Caribbean’s public relations efforts after the fire. She said sending Royal Caribbean CEO Adam Goldstein to meet with passengers in the Bahamas was a “brilliant move.” The company also tweeted a picture of one meeting. “It shows that you’re a responsible company. It shows that you care. It’s not just, ‘oh well, this incident happened,’ ” she said. Passenger Killinger said there was no comparison to the Triumph in her experience on the Grandeur. “We joked prior to all of this happening about the Carnival ships,” she said. After Monday’s fire, the Carnival ship Sensation was on standby to help the Grandeur and remained in its general vicinity as it powered to Freeport.